Our First Curl and First Tooth Box Set is a traditional keepsake gift done in a round design with My First Curl and My First Tooth engraved on the top of each box with a .875" x .25" area left open to add your optional personalization. The set is made in a non-tarnish nickel plated finish. 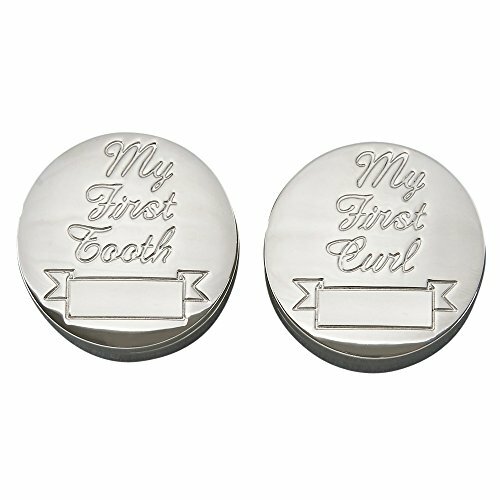 This Engraved First Curl and Tooth Set makes a unique gift for a child's birthday, baptism or christening keepsake. Each box has a lift top lid and measures 1.625" x 1.625" x .75". The inside of each box is lined with a dark red velvet lining. Silver gift box.